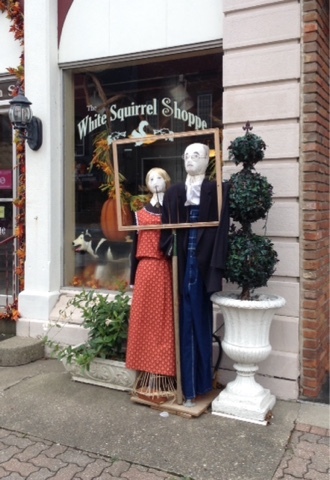 The town of Olney was well-decorated for Halloween with a dazzling array of straw-stuffed characters, or so I thought. They weren't meant for Halloween, but were scarecrows left over from the town's September Harvest Festival. It was a competitive event. Businesses and residences all through town contributed a creation. With all these scare crows there wasn't a bird to be seen. 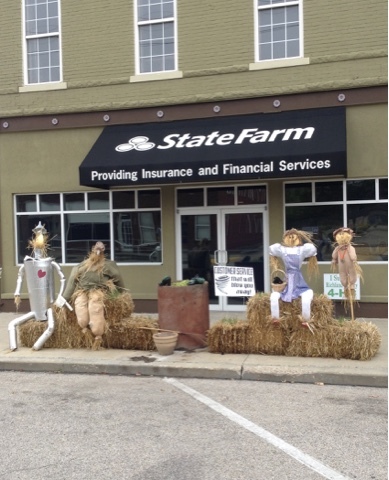 The winner was a State Farm Insurance office borrowing from "The Wizard of Oz" with four of its stars and an added exclamation of "Customer service that will blow you away" alongside a mini-tornado. A framing store paid homage to the farming community with a replica of Grant Wood's "American Gothic." 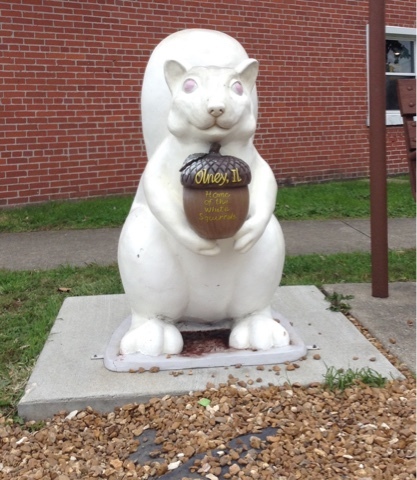 The shop's name, "White Squirrel Shoppe," was in reference to the colony of albino squirrels the town is famous for. They first appeared in 1902 and have been protected as a civic treasure ever since. A brochure included a map of the best places and times to see them. In the winter months, as it was for me with the temperature just forty degrees and ominously overcast, it was between dawn and noon. It was already afternoon and not a white squirrel to be seen, not even in their prime habitat in the sprawling City Park on the outskirts of the town. The only squirrels out and about in the park as I pedalled through it on White Squirrel Drive were a couple of standard grays. The scarecrows and white squirrels were all a bonus, as for me the town's great treasure was its Carnegie Library, a fine specimen with Carnegie Library uniquely spelled out in red up high below its roof line for all to see. 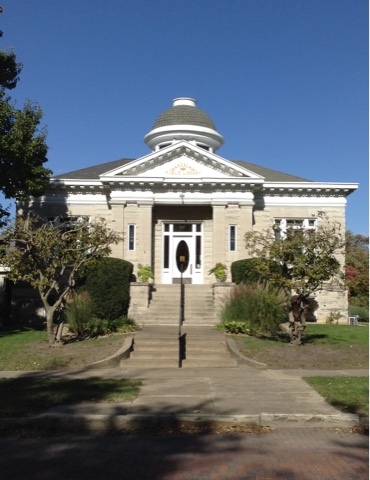 Even though it is no longer a library, it continues to serve the community as a museum from its prominent position on Main Street. 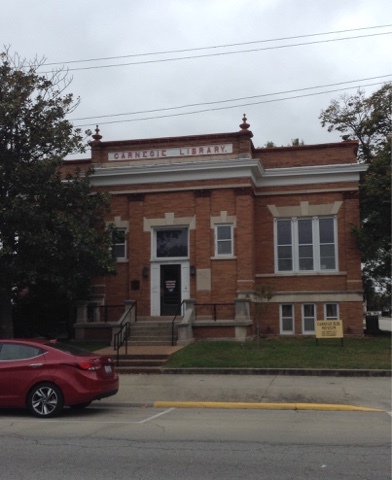 I passed through Charleston once again as I headed north to the next Carnegie in Arcola. I had visited the Charleston Carnegie a month ago on my way to the Hilly Hundred. I hadn't realized at the time that the fourth of the seven Linoln-Douglas debates had been held there. I hadn't explored the city enough on that visit to continue on to its magnificent main plaza with a monumental court house, otherwise I would have learned from its "Looking for Lincoln" plaque that the day of the debate, September 18, 1858, was "perhaps the most historically significant day in the history of Charleston." The sign didn't indicate that the debate had taken place in the plaza. There were statues at three of its four corners, but none of Lincoln and Douglas, as I had seen in Ottawa and Freeport. There were three bookstores in this university town around the plaza, but none were open, nor any other store this Sunday morning. No one was out and about in the cold. I noticed the police station a block away. An officer was sitting in his squad car. He told me the debate site was out of town at the county fair grounds and included a small museum. He added that one of the buildings on the Eastern Illinois campus was named for Douglas, but there was a movement to rename it since Douglas defended slavery. 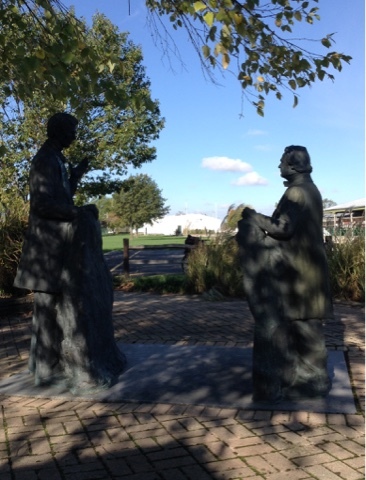 The statues outside the museum were life-size, Lincoln 6'4" and Douglas nearly a foot shorter. The museum was open but unattended. A small auditorium showed a movie of a reenactment from 1994 of the debate. Even the people sprawled in the grass dressed in the period. One couldn't tell if it attracted as many people as the original--10,000. The Lincoln impersonator wasn't fully authentic, as he declined to shave his beard, saving it for performances of the later, bearded Lincoln. One could also listen to snippets from each of the seven debates and read quotes from the various debates trying to guess who they came from. Visitors could compare their hand and foot prints to those of the over-sized Lincoln. The museum was worth worth seeking out. Someone in the guestbook had written, "Only one more to go." I have four. The next Carnegie in Arcola, as I closed in on Champaigne, was even more exemplary than the one in Olney, highlighted with a dome. It had had a significant addition to its rear, but unlike many Carnegies, one could still enter through its front, original entrance, mounting the set of steps giving one that Carnegie-sense of ascending to knowledge. Arcola also had other attractions, enough to have a tourist office despite a population of just 3,000. 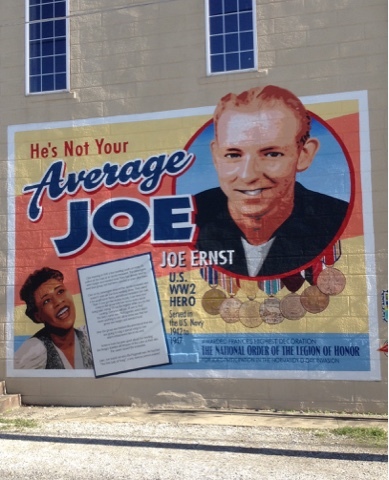 Mini-murals throughout its business district paid homage to the town's past. One remembered Ella Fitzgerald and her entourage stopping at a local restaurant in 1941 and being served by a young man who went on to be a WWII hero. Many of the locals, including the owner of the restaurant, weren't pleased at all that African Americans had dined there. This was a time when small towns in the area had ordinances prohibiting African Americans from being on the streets after sundown. 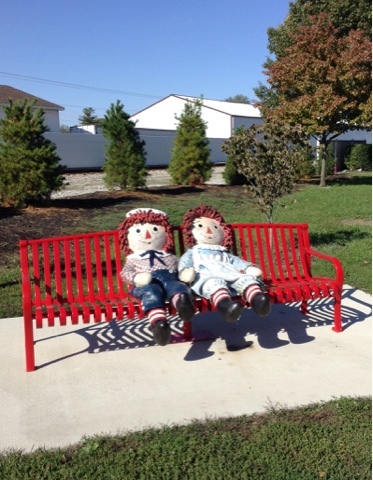 Another acknowledged John Barton Gruelle, creator of the Raggedy Ann and Raggedy Andy dolls and storybook characters, who was born there. There was a monument by the tourist office homoring him and the dolls. 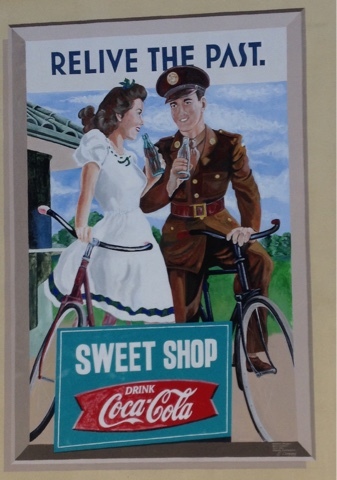 My favorite of the murals though was bike-related. 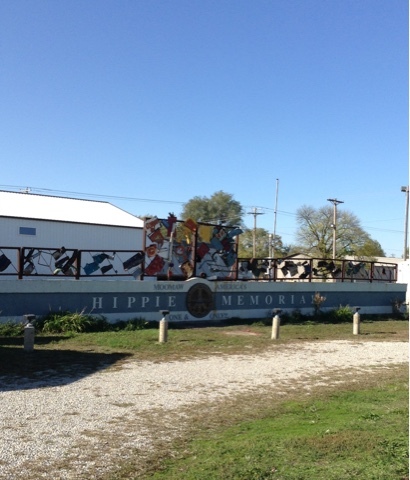 The most amazing monument was a sculpture paying tribute to the Hippies, said to be the only one in the world. It was sixty-two feet long, one foot for each year of the life of its creator, Bob Moonaw, who died in 1996. It included a WOODSTC license plate. The middle upraised section is the era of the Hippies, when people could stand tall, but then drops with the advent of Reagan and the return of "small-mindedness." Though he regretted he wasn't a Hippie, he greatly admired their freedom of spirit, rebelling against oppression and repression and giving people "room to breathe." When the monument was dedicated after his death, his wife gave a most stirring speech explaining the sculpture and his thinking. 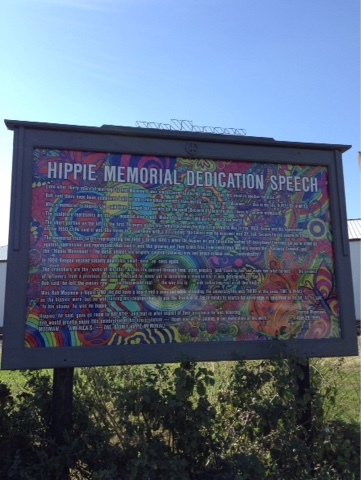 A transcript of her speech was mounted beside the monument. His basic philosophy was the "Hippies changed the world for the good." He most appreciated that they made it acceptable for those like him to no longer have to conform. In a "Chicago Tribune" interview he described his life as "one long dental appointment." Even back then he observed, "America, you're turning into a nation of minimum wage hamburger-flippers. Rebel. Think for yourself." The largest Amish community in the state resides nearby and has a shop in town. They would no doubt concur with many of his observations. Continuing north eight miles to Tuscola brought me to another Carnegie, still a library with a small additon tacked on to its side providing a street level entrance. 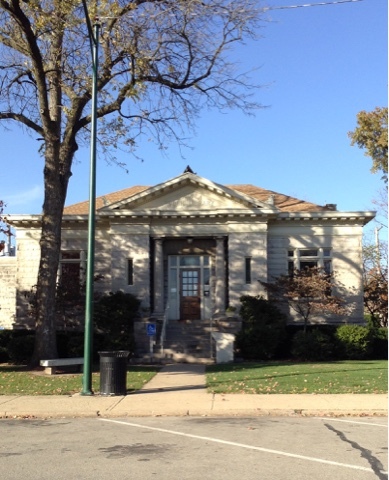 The addition was of the same noble limestone matching the rest of the library. 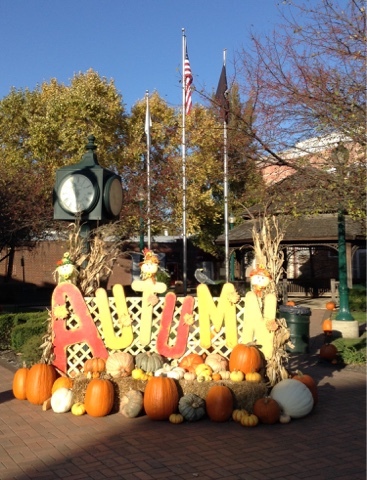 The town was brightened with seasonal decorations. It was another day with the temperature hovering around forty, but at least the sun shone bright. I could sit and absorb its rays and warm up freed of the wind chill I create as I pedal along. But the road is looking after me, as if it is encouraging me to keep riding, to go on to Indiana where a cluster of Carnegies in the northeast corner of the state beckons. The day before it provided a hooded sweat shirt that I was able to wash at the motel I stayed at. 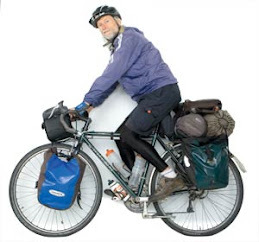 I put it on at the Lincoln-Douglas museum when even after twenty miles of riding I hadn't fully warmed up. That extra heavy layer finally put an end to the chill I had been feeling the last couple of days. A week ago, before I needed it, the road offered up a right-handed, middle-weight glove. I had developed a hole in the forefinger of the glove I wear on my right hand. It was no problem until the temperature fell below fifty. Then I'd have to curl my hand into a fist to keep the wind from numbing my exposed finger tip. After I left the museum a car with a woman and two young girls in their Sunday best stopped and waved me over. One of the girls in the back seat rolled down her window and presented me with a two-pack of hand-warmers, just what I'll need if I have to ride in a cold rain again. The instructions say they will provide warmth for ten hours. A bit later my eyes caught sight of a pair of heavy-duty, high-tech robin's egg blue Nike socks that go calf-high and are labeled right and left. The semi-tourist town of Arcola had a public restroom with hot water, where I was able to give them a good wash.
A couple days earlier the road was extra beneficent, presenting me with a coin purse containing two twenties, a ten, two singles and change totaling $54.45, which was slightly more than the cost of my motel. The only ID in it was two sales receipts from a Walmart in Tennessee. All I need now are a pair of jeans to provide a better windbreak than my summer-weight tights. I am losing a lot of body heat through my legs. There have been plenty of resale stores along the way, but none lately. I'll no doubt have a choice when I swing over to Champaign. I'll be in a great celebratory mood, as I'll have completed the slate of Carnegies in Illinois. Only one awaits me in DeLand to the west of Champaign. It will be hard to turn north to Chicago and bring these travels to an end. I might just keep heading east for a few Carnegies north of Indianapolis and then along the eastern border of the state up to Michigan for a bunch more, almost as many as the twenty-six I have gathered since leaving Bloomington three weeks ago. Boswell, Indiana--"Hub of the Universe"